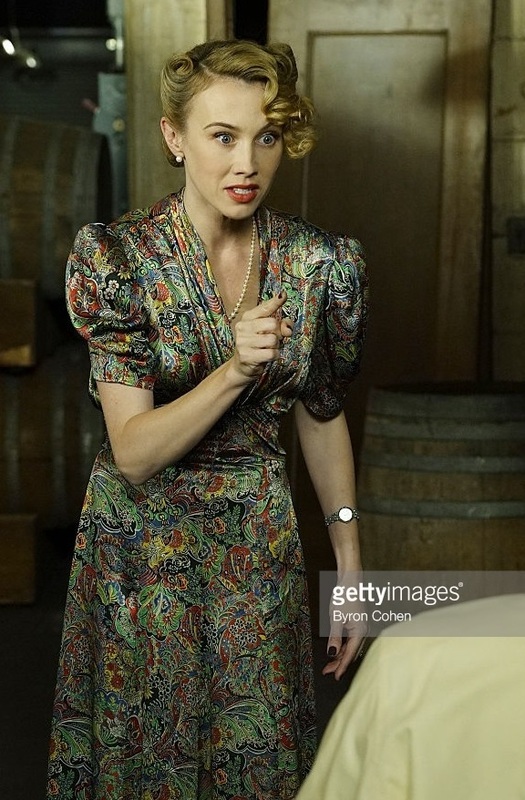 Among all the inspiration to be found in Marvel’s television show “Agent Carter” Season Two, I cannot help but notice the classy, stylish mode of dressing of the villainess, Whitney Frost. 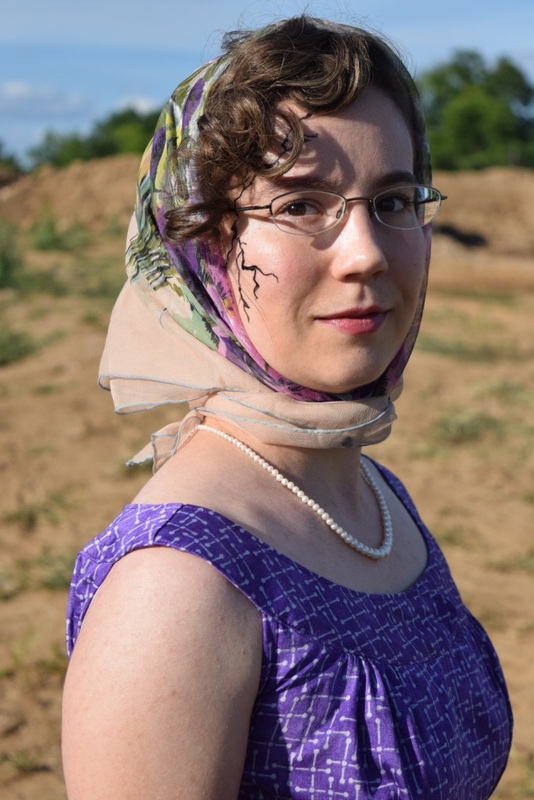 I kind of feel like a traitor to flaunt the persona and appearance of the opposite of Peggy Carter (I am one of her biggest fans, besides being an American). However, Ms. Frost is another strong woman with a strong will, powerful ideas, and a drive to do something big and worthwhile, quite similar to Peggy, even if Whitney’s mind went twisted and her intentions corrupted. So, here I am taking on a style of a new year I have not yet sewn before (1939), with the dark aura of a mysterious film star. 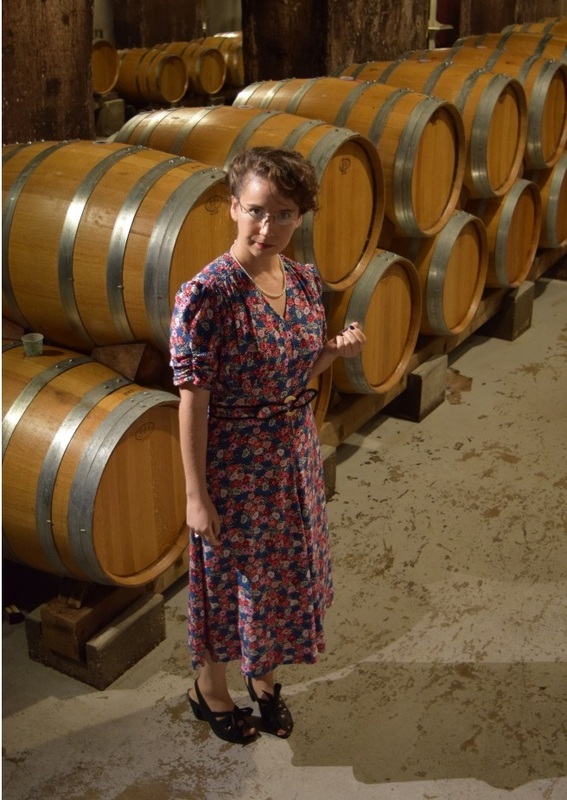 Under the earth in a wine cellar, light and shadows take play here, like two faces in mine…akin to the forecasted two-faced future of Whitney Frost as “Madame Masque”. 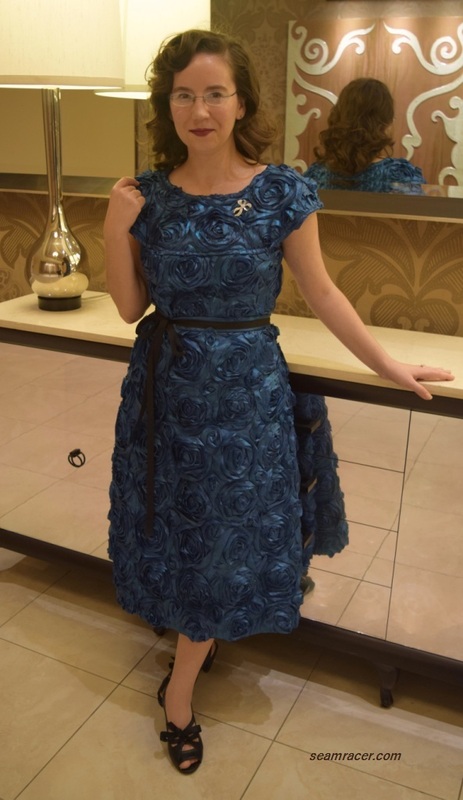 TIME TO COMPLETE: This dress and belt were made in about 12 hours and finished on June 11, 2016. THE INSIDES: So nice! All bias bound. Inside the front bodice is a very nice, full chest-covering facing, perfect for anchoring all the shirring into place and keeping the gathers controlled. 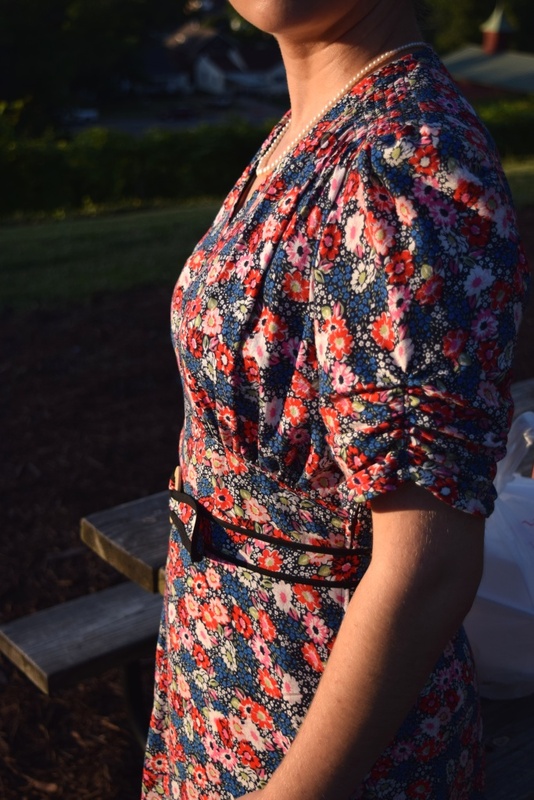 TOTAL COST: The rayon fabric and the notions were bought on deep discount at Hancock Fabrics before their closing, and everything else came from on hand, so my total for this dress is probably about $8 or less. 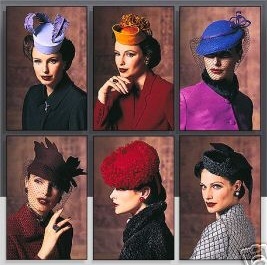 Superior patterns are unprinted and are trademarked by the Sears Roebuck and Company. 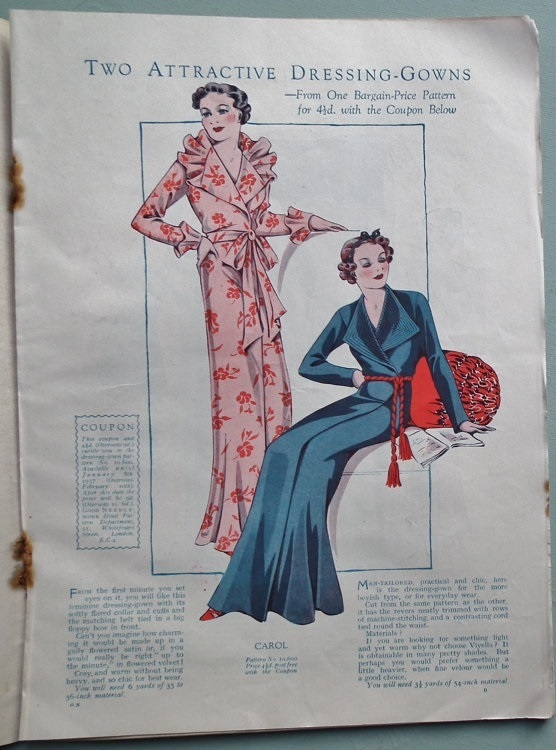 I am frustrated at the complete lack of info to be found about this line of sewing patterns but from what I have seen they seem to have been printed in the 1930’s and 1940’s. For such a lovely “white elephant”, I do have a great certainty of dating my pattern to year 1939. 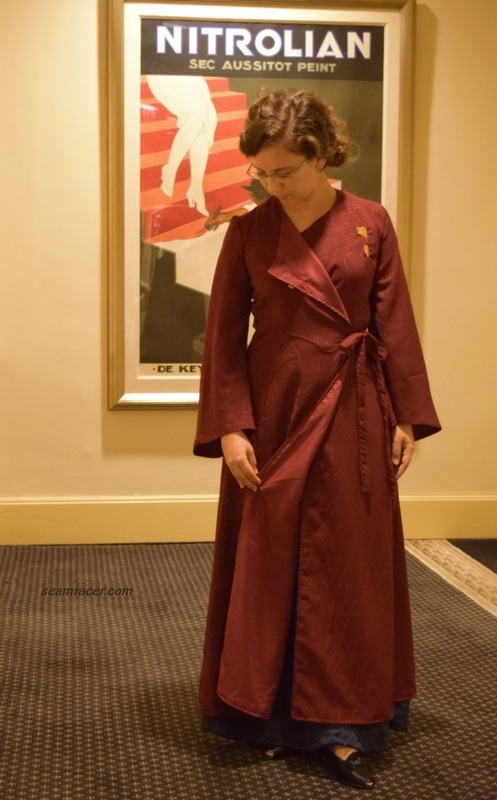 Not only did it require 2 ½ yards of material with my 60” wide fabric (complete lack of rationing), but the sleeves, shoulders, and especially the skirt portion of the dress have a very specialized shape seen in 1939. 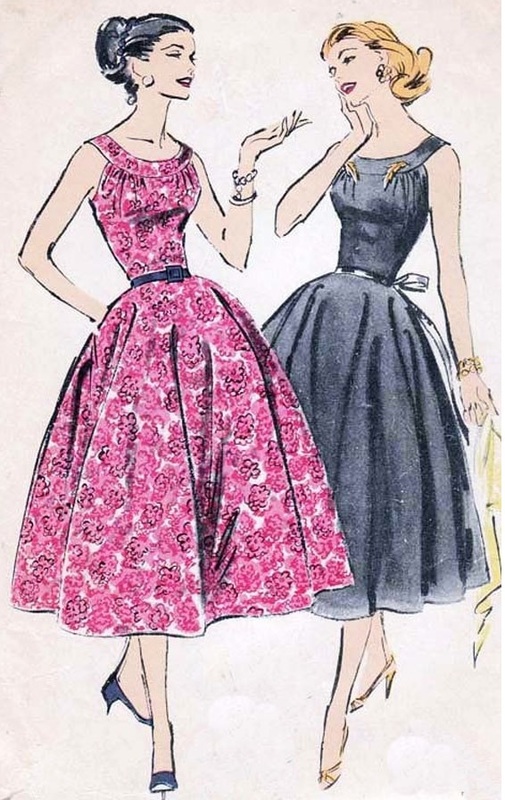 Skirts and dresses up to 1938 were still longer (mid-calf) and slender or extremely full (with lots or gores), while starting in 1940 and 1941 skirts and dresses became more frequently pleated, controlled, more close to the knee. 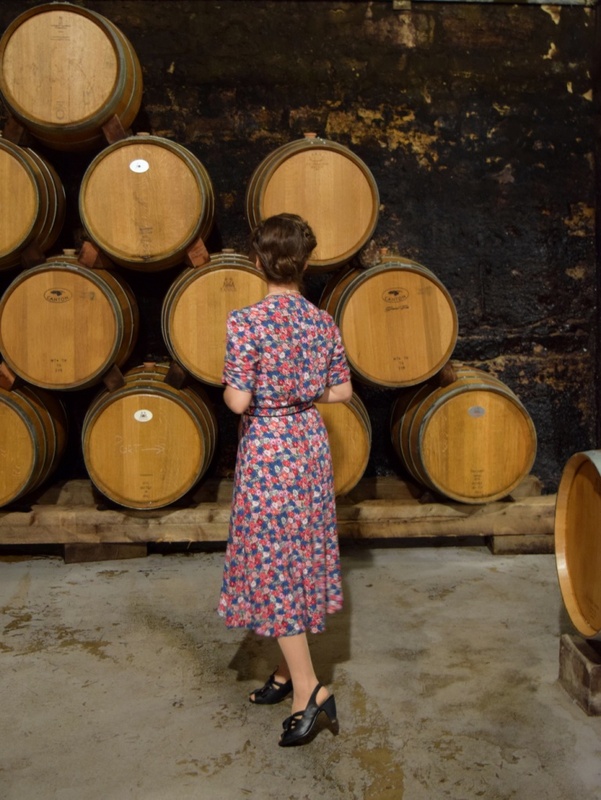 As a good friend of mine (who knows about fashion from this year) told me, skirts in 1939 were full and had more swing in them than both your normal 40’s and 30’s bottom, and that is definitely this one. 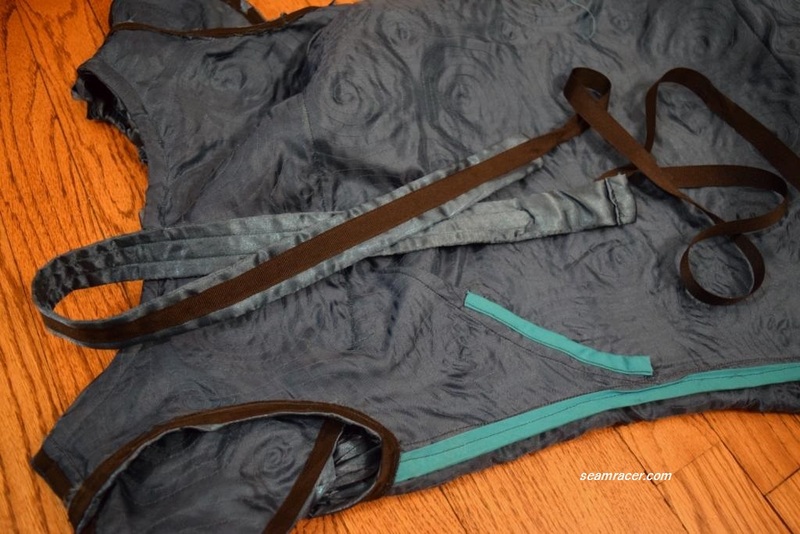 The pattern pieces for the skirt panels were such wide A-line shapes I had to pare them down a bit, while the center front seam was shaped like a crescent pointing out so the front has an interesting drape to it. My skirt hem also lands between mid-calf and the knee, although it is so full it ends up looking longer. 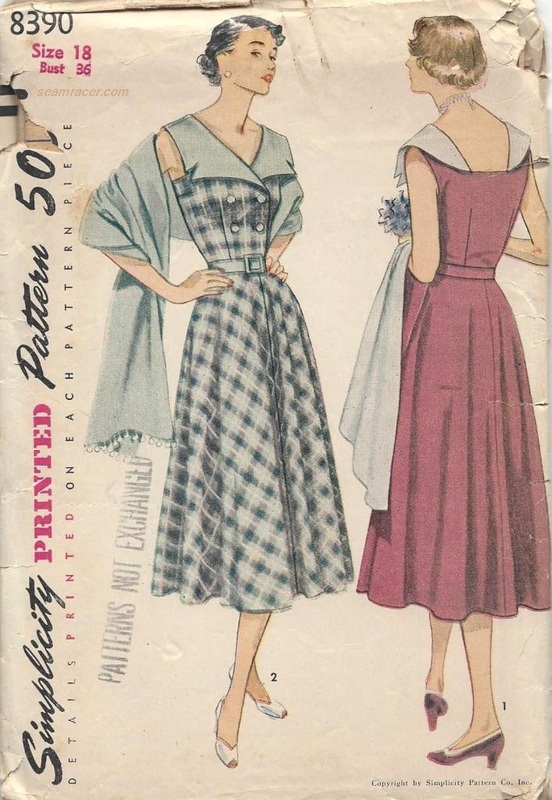 My dress’ sleeves are also very 30’s (besides being the same as in this ’38 pattern from my stash) and the large 6-row shoulder shirring is something not seen past 1940 (just rarely). 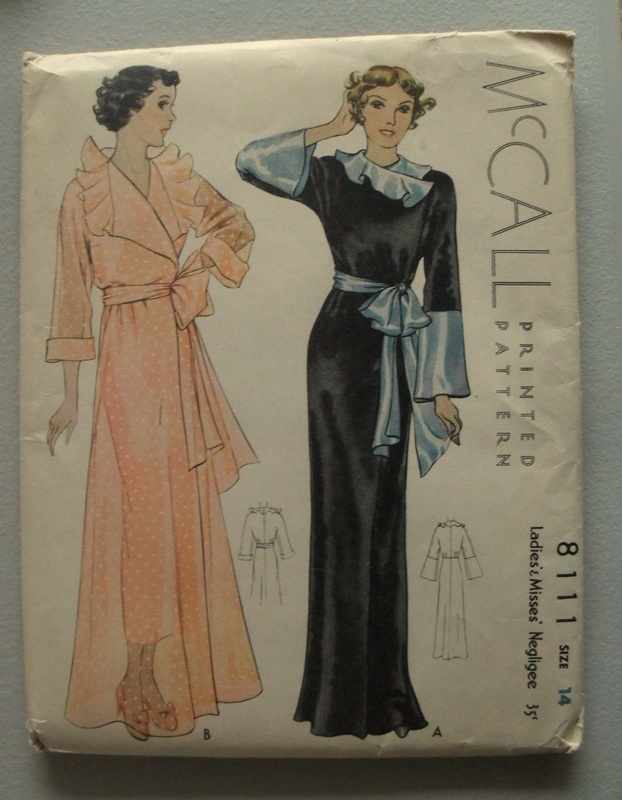 The more I look at patterns, dresses, and catalog images from ’38, ’39, and ’40, I become more convinced I am correct with dating my Superior pattern to 1939. 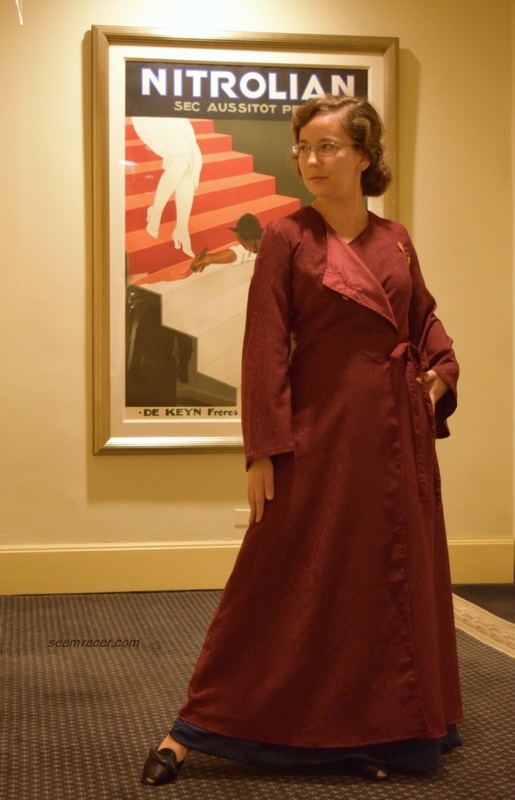 Besides all the “proof” I just laid out, my final showing on this topic is a dress from the Jonathan Walford book “Forties Fashion”. 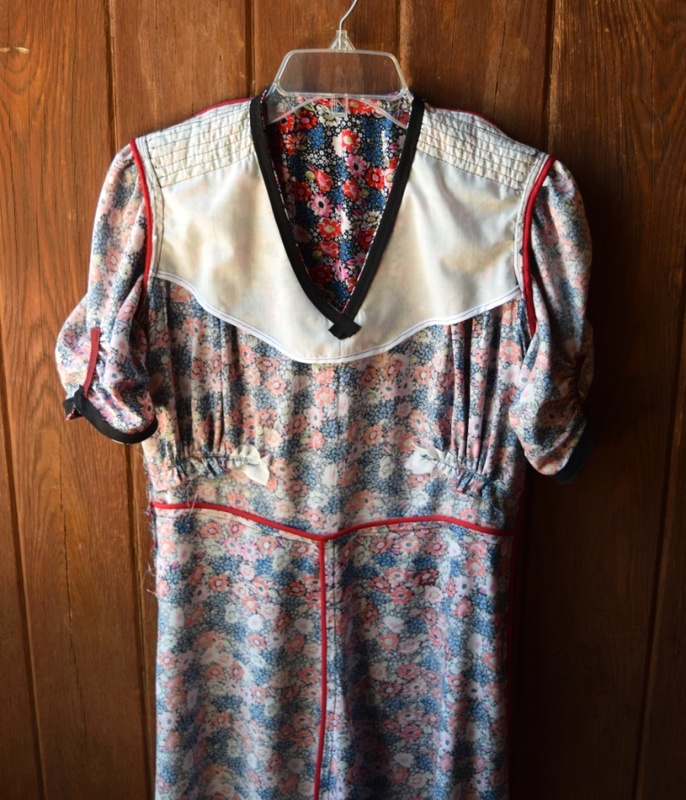 It is listed as “Canadian crepe afternoon dress, ca. 1939 – 1940”. 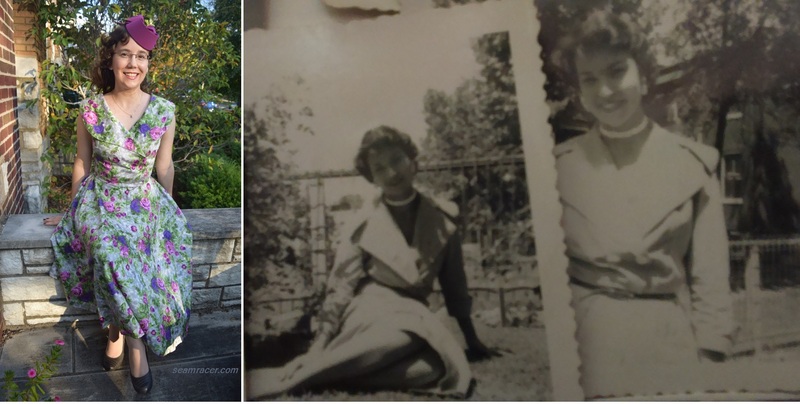 As you can see at right, this extant dress was my true inspiration, almost to a point of copying it fabric-wise, and the style lines are almost exact as my Superior pattern. 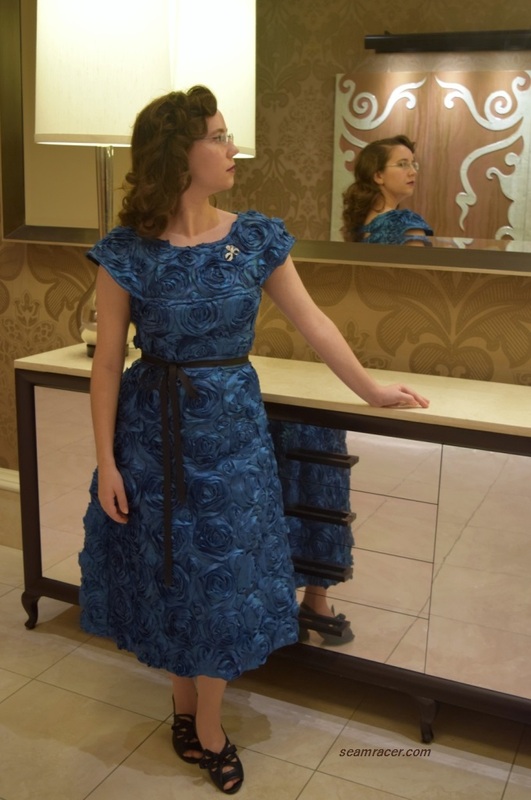 Oh well, when I see a dress I really like, and I happen to also find a very similar fabric and pattern, I can’t help but sew a re-make, especially when it can also be similar to something from “Agent Carter”! 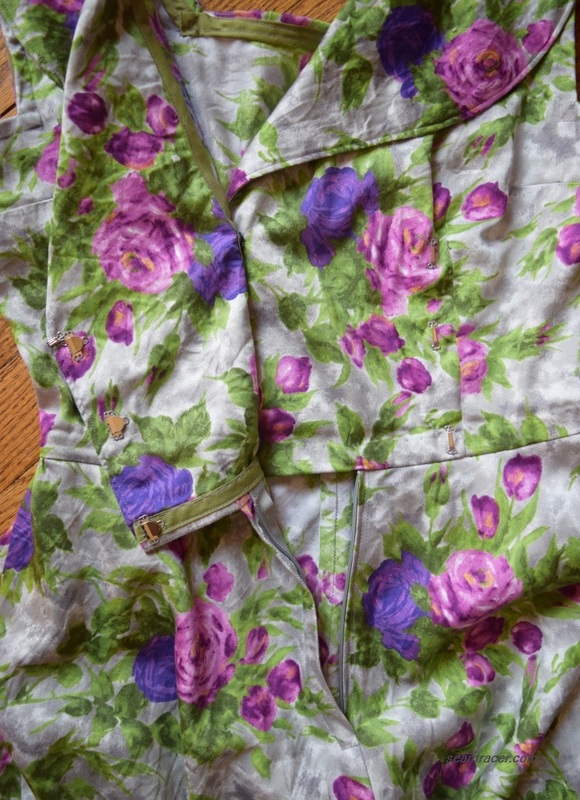 As to more crazy oddities, here is the first vintage pattern I’ve seen which specifically calls for a “zipper”. 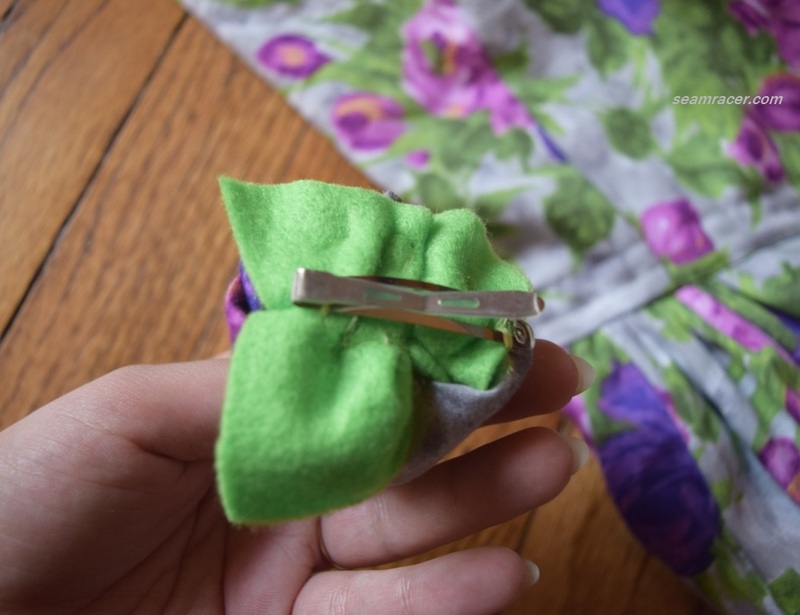 That is a specific brand name and never is such a notion called anything else than a “slide fastener” on all my other old patterns. 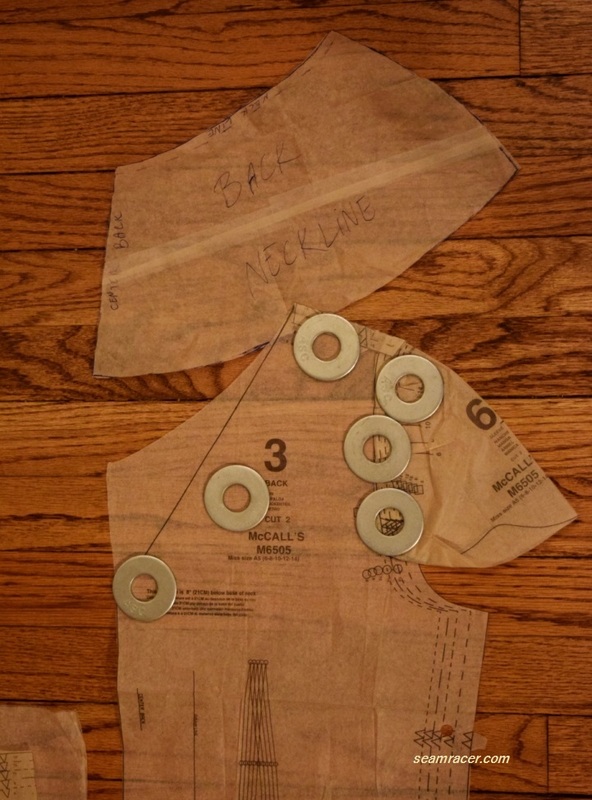 Perhaps, because this is a pattern coming from a department store and, as the front envelope points out, you were expected to buy what you needed to make this pattern from Sears as well and that “zipper” brand is what the stores carried. This is just my supposing, I don’t specifically know for sure, but do any of you know? 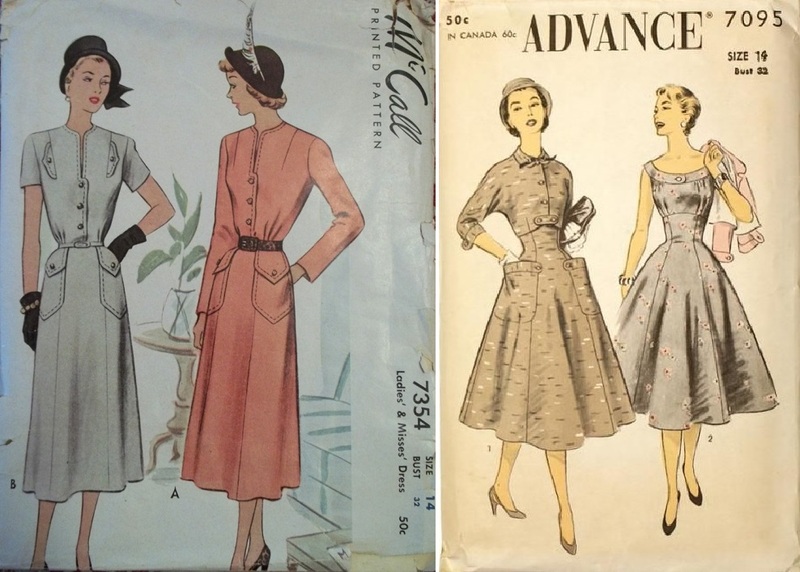 Have you seen a “zipper” specifically called for on your old (1950 and earlier) patterns? As this is an unusual, rather rare brand, I did a good amount a checking beforehand so I could estimate how this pattern would fit, the amount of ease, and the proportions. 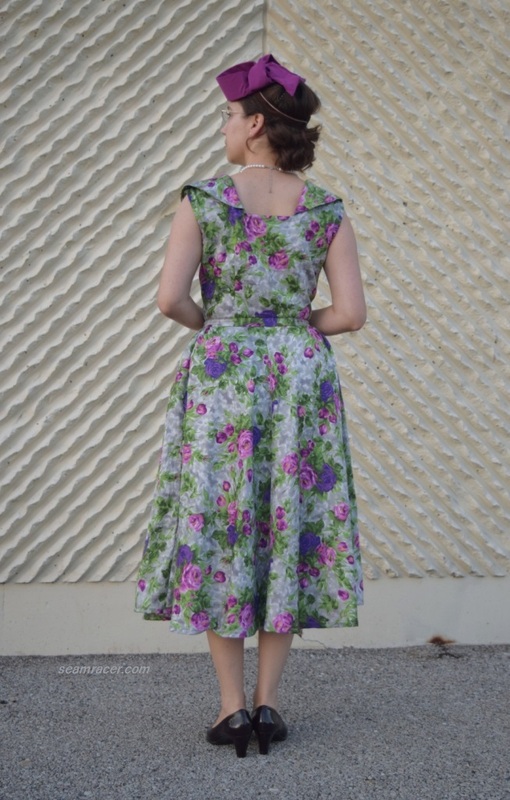 My experience with vintage pattern lines outside of the major brands, such as DuBarry, New York, and 1940 and older Buttericks to name a few, has convinced me that they seem to have a tendency to run short in the shoulder-to-waist, have very long hemlines, generous upper arm room, and wide hips. Otherwise the proportions are generally right on. 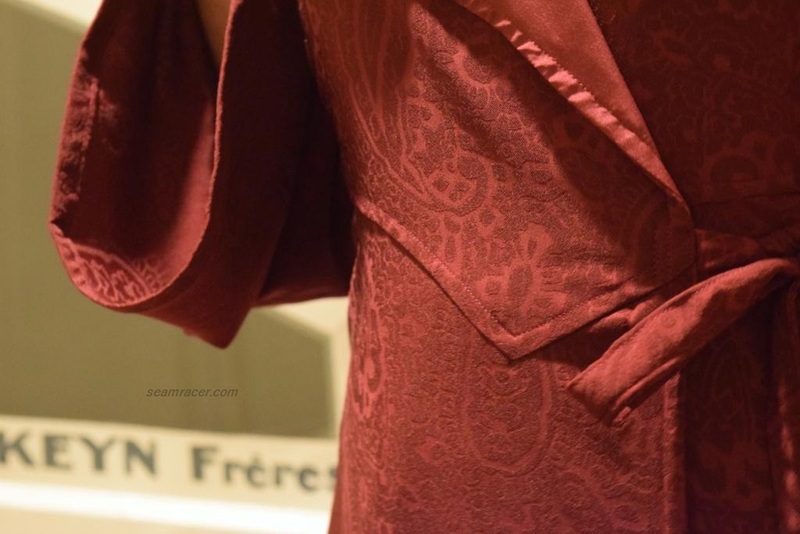 I automatically assumed all of the aforementioned pattern tendencies would hold true for this Superior pattern, and from doing a tissue fit on myself, I was correct. 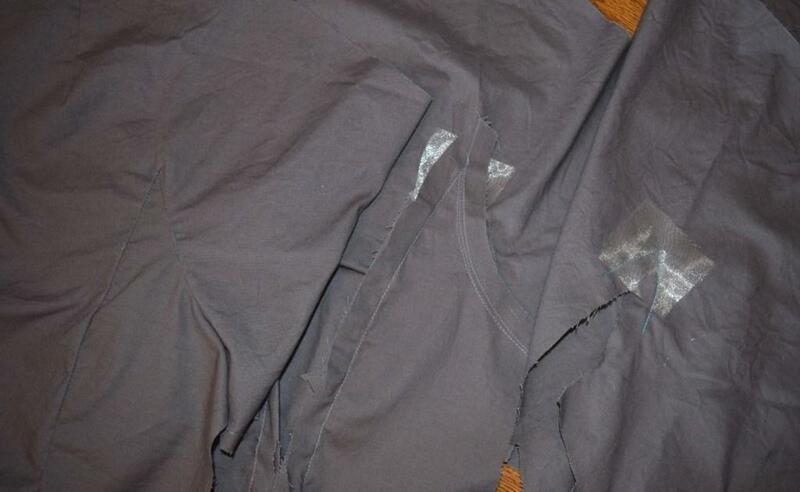 Besides grading up to my size, I added an extra ½ inch to lengthen the waist and took out 3 inches from the skirt length. 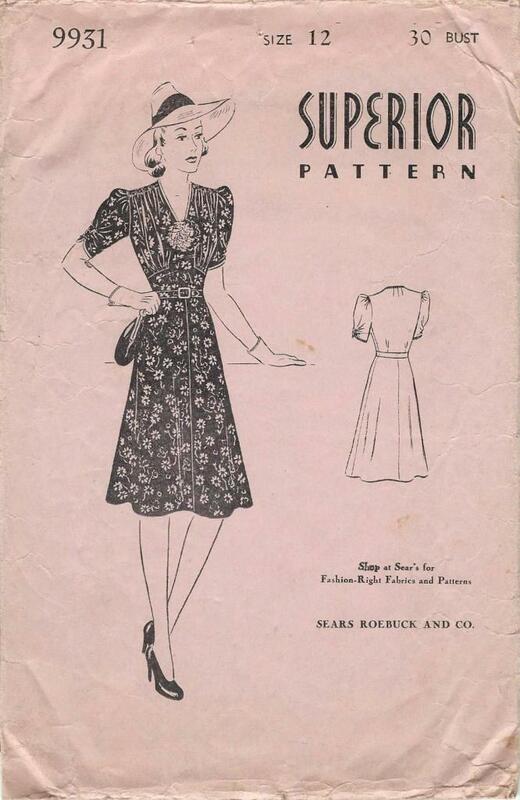 What intrigues me is the fact that the pattern apparently to have been used to make a dress for a very petite lady or possibly a teenager from 1939. Each piece had been folded in to make it about an inch smaller in proportions and shortened even more than my 3 inch downgrade. The tissue is in great condition, but it had obviously been like this quite a while, and the old pins had rusted in their places. It’s a very grown up and classy dress for a tiny young lady to wear. 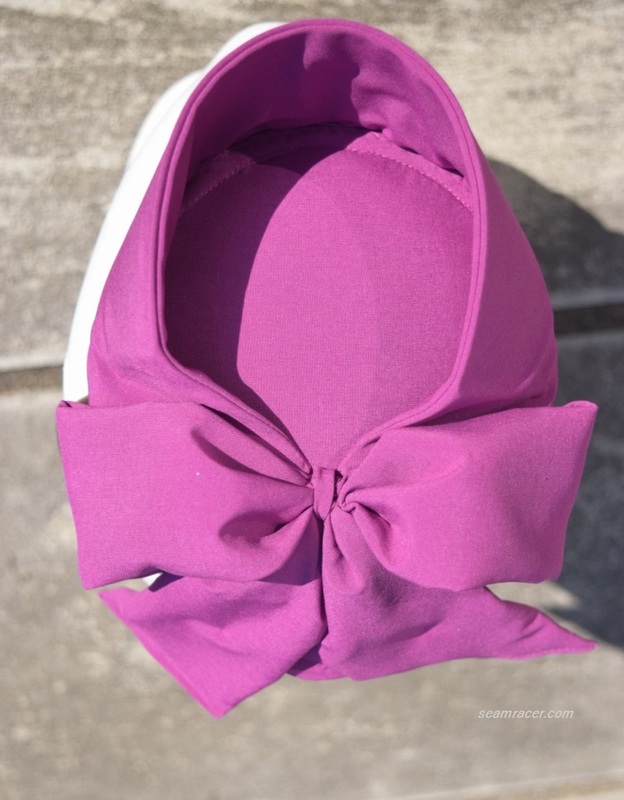 Maybe it was made for a graduation or dance?! 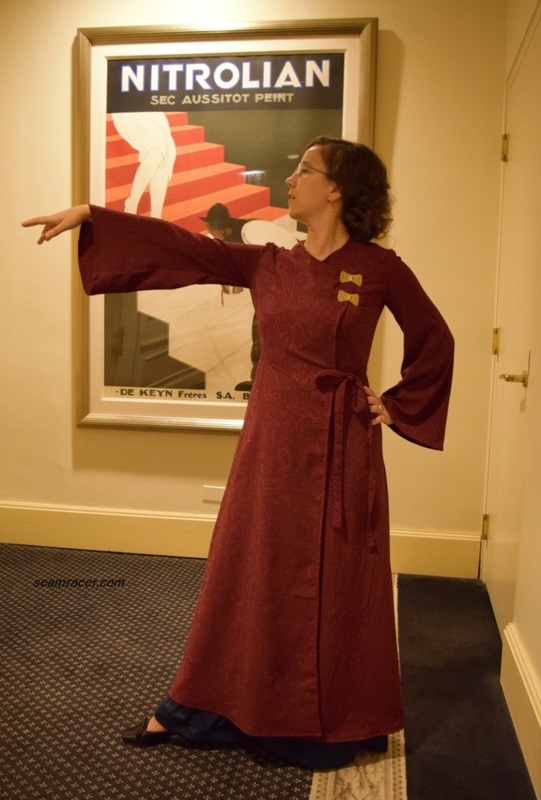 My making of this dress was ridiculously easy for every other part besides the front bodice. 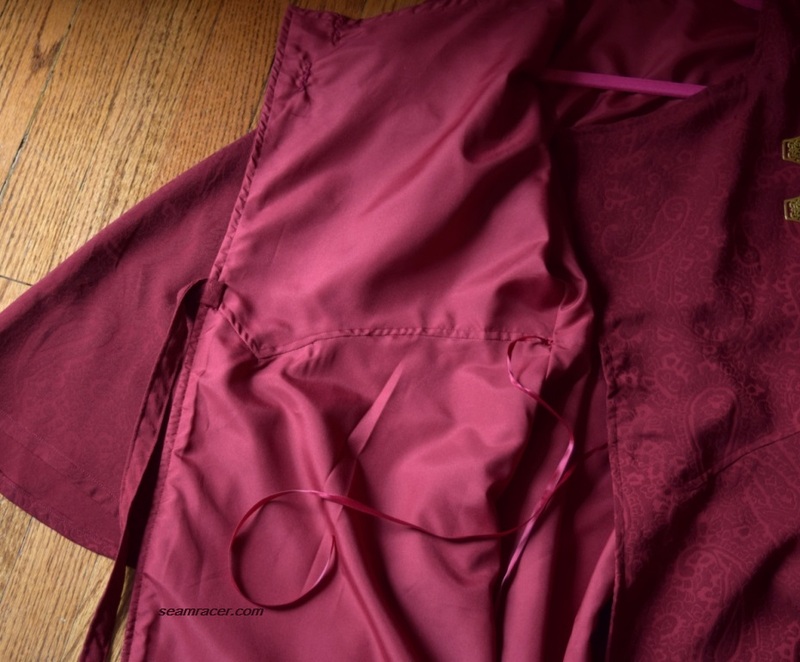 With almost everything going on (detail wise) there, stitching the bodice front took just slightly more than half of the time spent for finishing the rest of the dress. 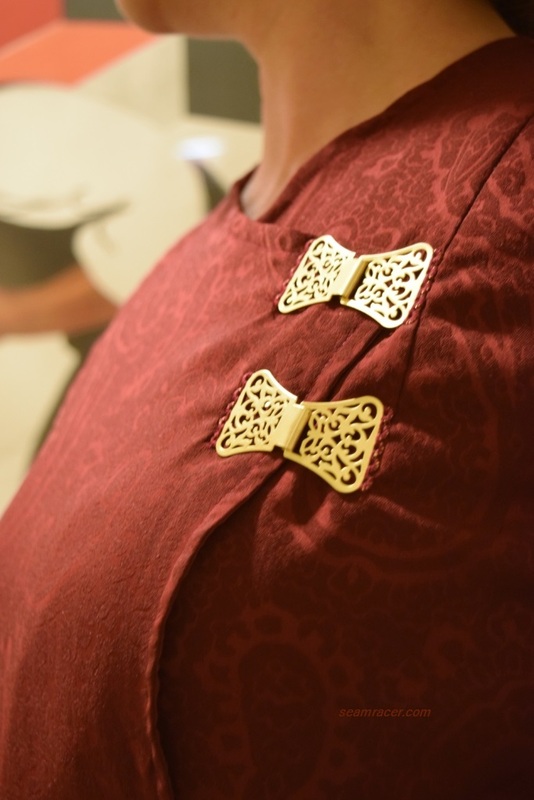 Not that the bodice details were hard, merely challenging, precise work which took a good amount of patience and time – all so very worth it in the end when I first saw the finished dress! 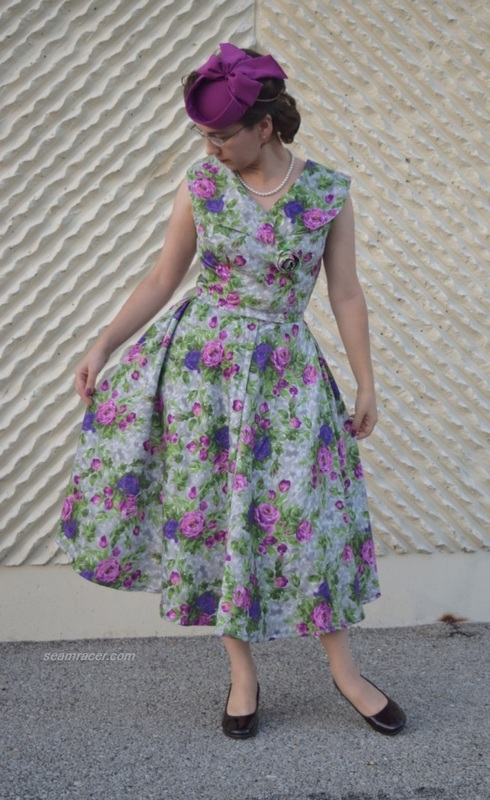 Once the dress was first worn, I was so pleased…this is one of my most comfortable vintage dresses and the most easy to move in. Now, if you don’t mind, I’d like to point out some of the lovely and subtle details which get lost too easily with the busy floral print. 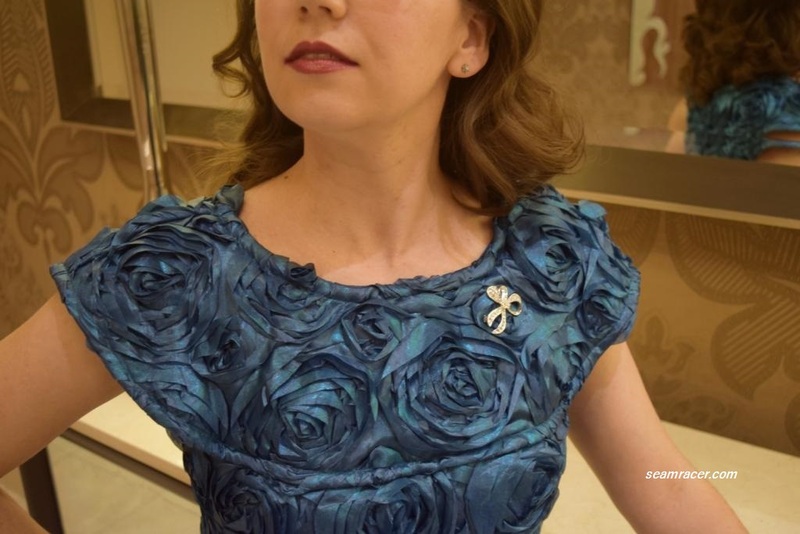 There is a “slash-and-gather” section below the bust but above the waist to on the bodice sides. 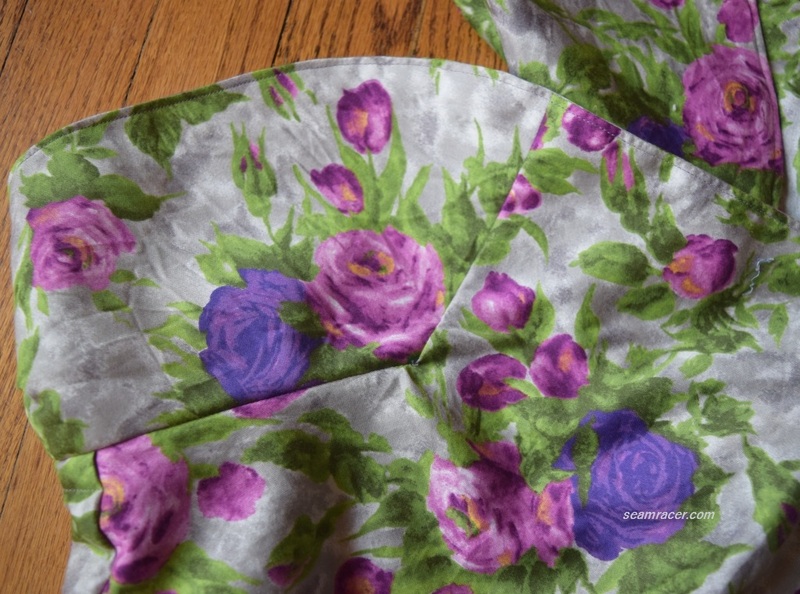 There is also 6 rows of shirring running the width of each shoulder. 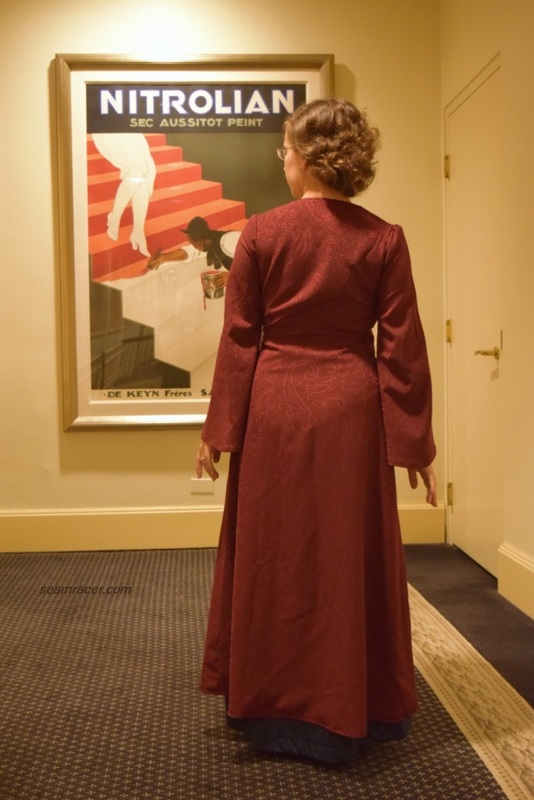 The back is pretty simple with two off-center box-pleats at the waist and a trio of fan shaped neckline darts. 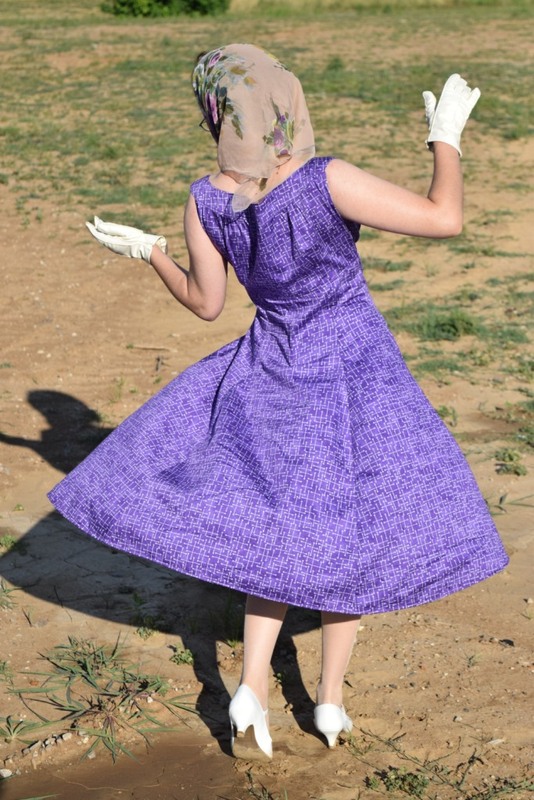 Like a mentioned above, the skirt portion is wide and flowing, composed of four large A-line shaped pieces cut so the straight grain runs down the middle and the bias on the sides, with the front center crescent shaping out for flare. 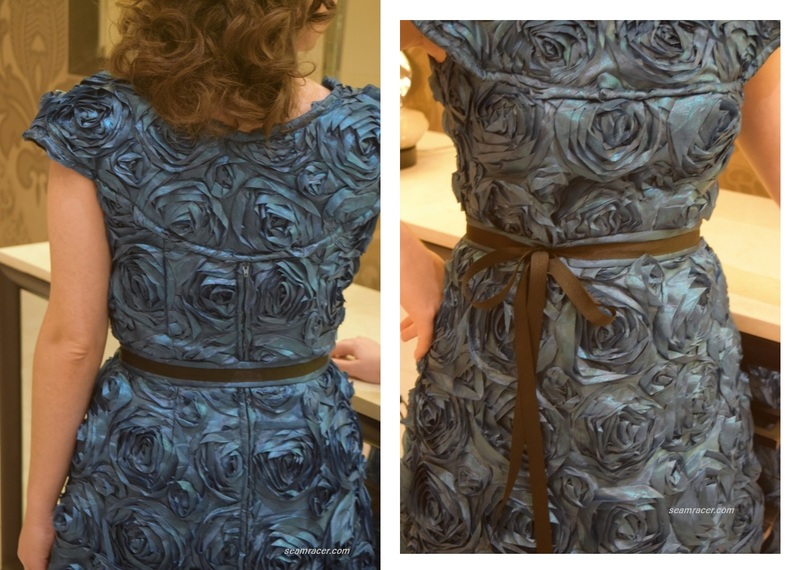 At the front waist there is a slight V dip (hidden by my belt) and my sleeves…oh how I love them! 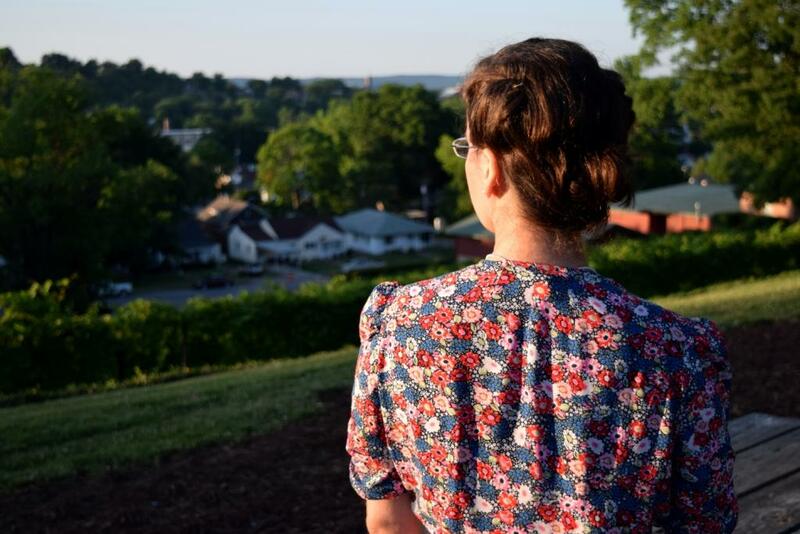 An arched hem with shirring up the center totally completes this dress. 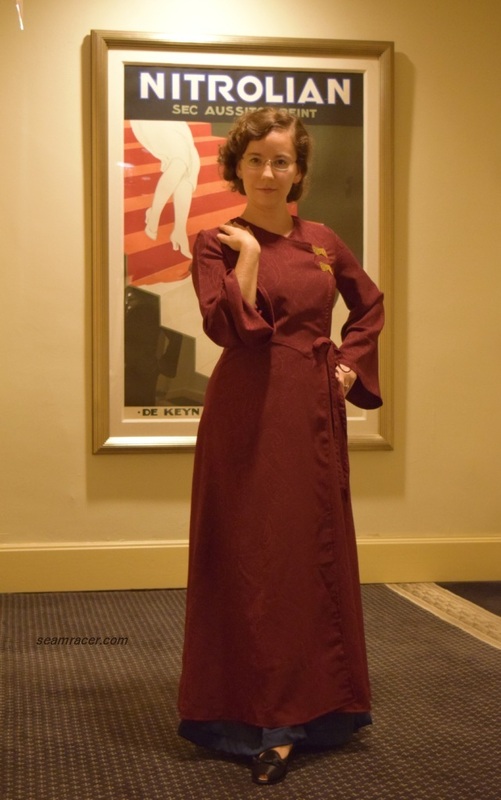 I definitely want to make this again from a solid color fabric, in a rayon jersey knit perhaps, so that all the lovely details stand out better. 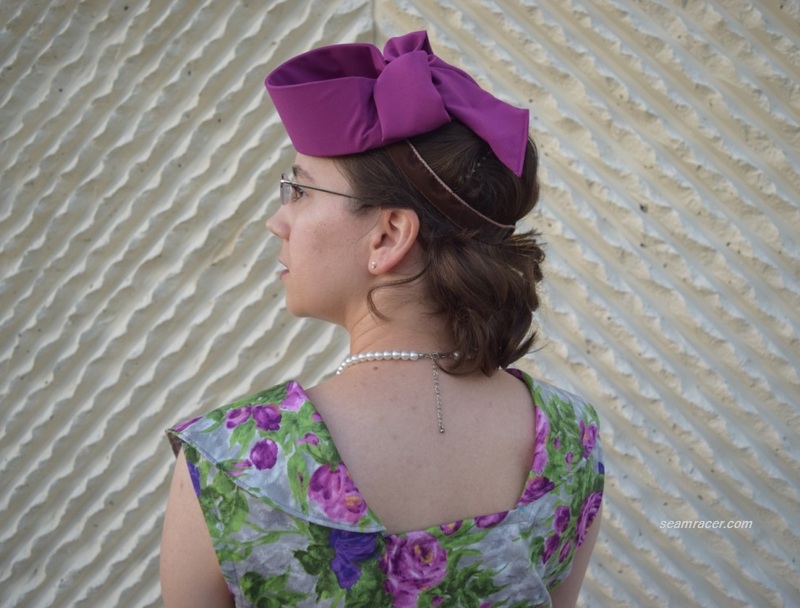 The belt is not part of the pattern and is something I self-drafted so it could be like the extant original shown in the “Forties Fashion” book. Besides, I just so happened to have a perfect straw covered ring for the belt, something leftover from this past re-fashion. 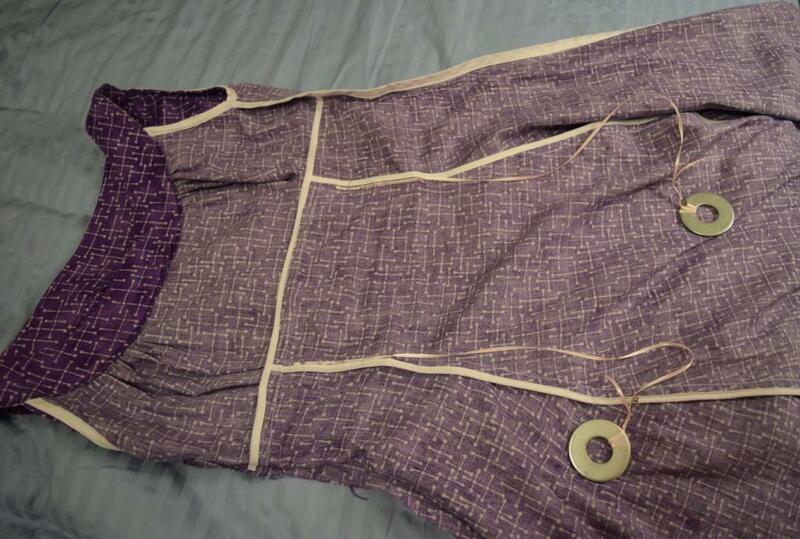 I used the tie belt pattern with my dress as my benchmark, ironed in “Stitch Witchery” to stiffen it like belting, then cut it to shape (skinny with tear drop ends) and stitched the edges over with ¼ inch bias tape. Easy. I only have the belt ends together with a safety pin for now because I don’t exactly know what to put in to make the belt completely adjustable on both ends. Perhaps I’ll add in a few positions of hook-and-eyes at some point. 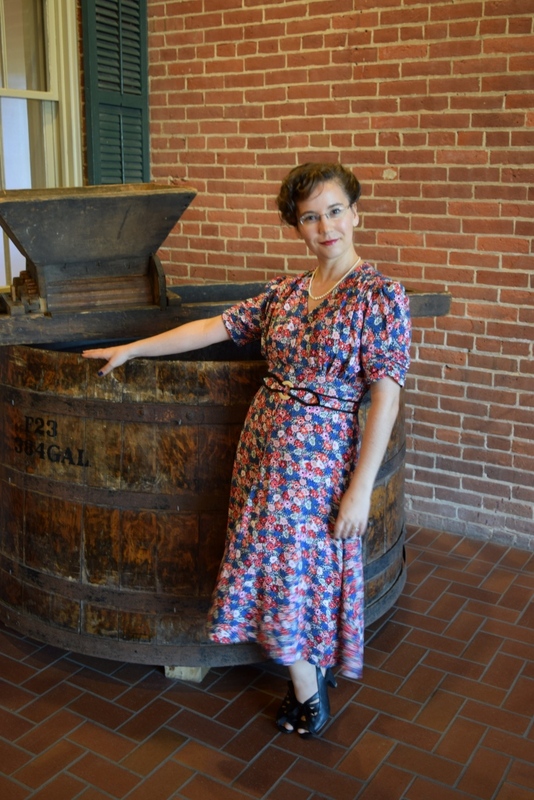 As I am technically wearing an “afternoon dress”, and Whitney Frost (in “Agent Carter”) was wearing her similar dress at her Italian boyfriend’s warehouse full of wine barrels, we took a day trip out to enjoy an afternoon visit to a winery, where we took a tour of its cellars, and enjoyed good food and drinks. 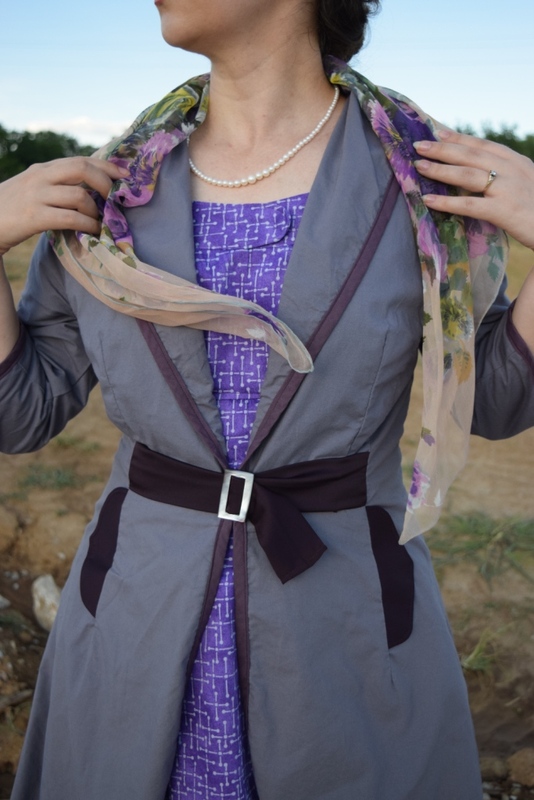 It truly was a lovely day and perfect occasion to wear such an effortlessly elegant ensemble. 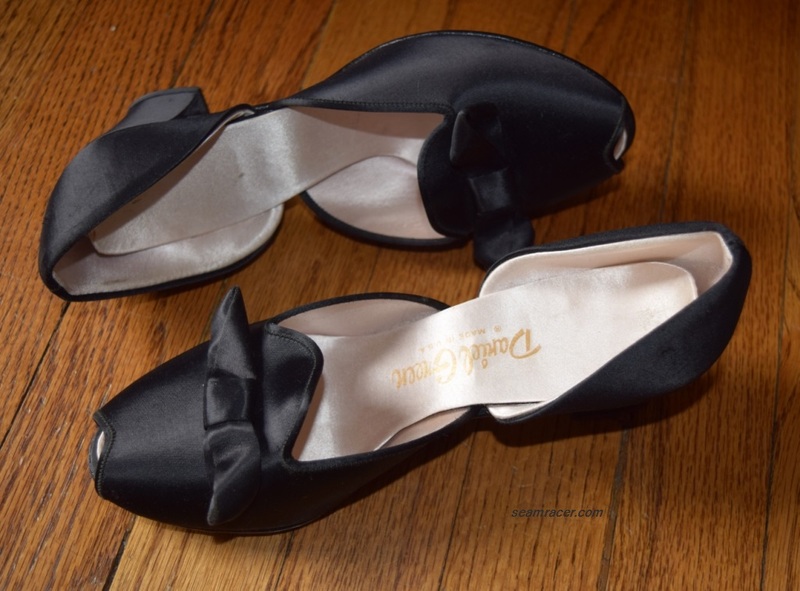 My “Chelsea Crew” brand “Mandalay” sling back, peep-toe, tie-up shoes were incredibly comfy, too – highly recommended. 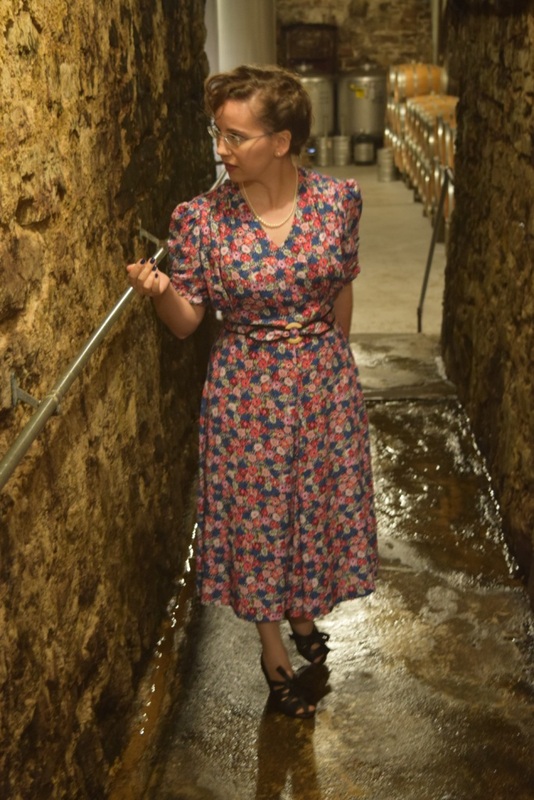 What is not recommended is to touch an old, damp cellar wall…I did by mistake and yuk! Touching it might not be a bad as Zero Matter, but jelly mold and armadillo bugs is a pretty gross combo. 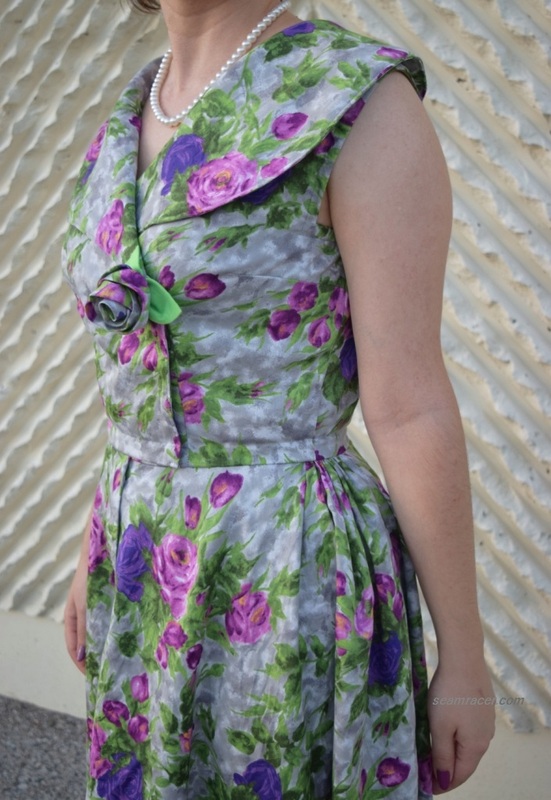 It’s a happy boon to make a dress that gives rise to a fun outing. 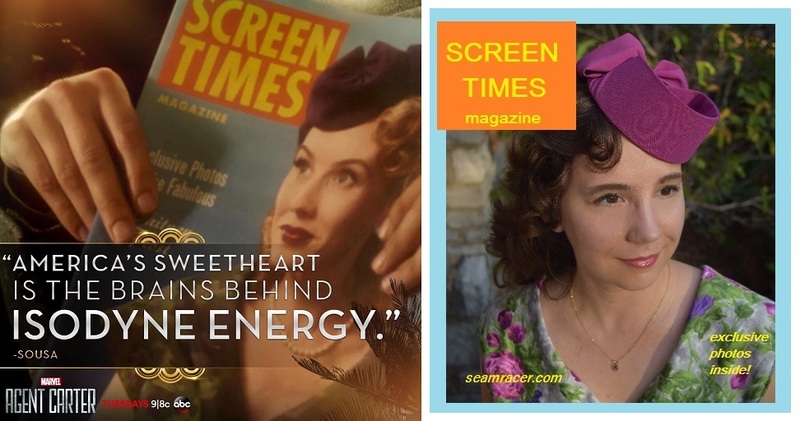 Better yet, I get to bring a little bit more of the “Agent Carter” series into my wardrobe and explore another character. Best of all, I now have a ‘new’ year (1939) sewn up and understood a bit better. 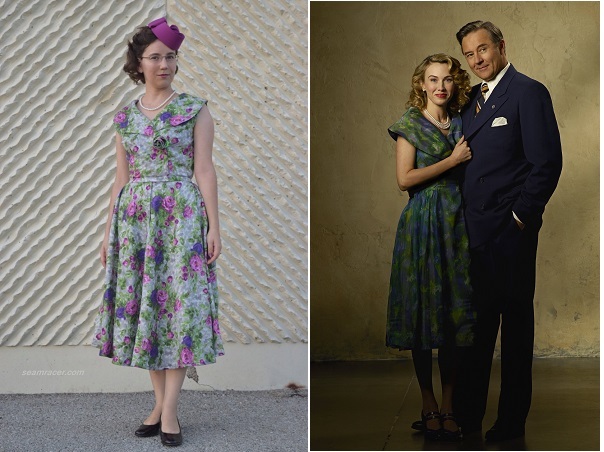 Look out for more upcoming Whitney Frost dresses in the 50’s style, as well as a few Agent Carter 1940’s ones, here on my blog! P.S. 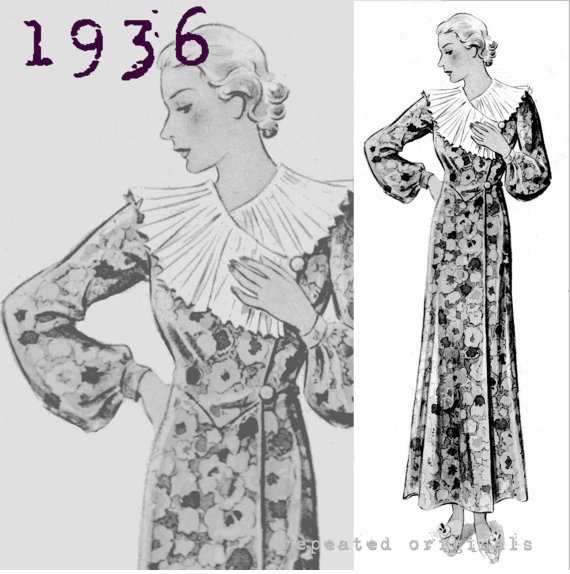 – for some more 1939 styles and inspiration, see “Emily’s Vintage Vision’s” post (link here) of Du Barry Prevue for January ’39!